By Send2Press Newswire on February 14, 2011 in Business, Finance, Management Changes, New Jersey, Press Releases, WALL, N.J.
WALL, N.J., Feb. 14 (SEND2PRESS NEWSWIRE) — Peter Grandich, founder of Trinity Financial Sports & Entertainment Management Company, Atlantic Avenue, announced today that mortgage industry expert and Broadway Producer Barry Habib, as well as former Deputy Attorney General Robert F. Munoz, have joined the company’s corporate advisory board. Grandich also expressed his admiration for new corporate advisory board member Robert F. Munoz, a former Deputy Attorney General. Grandich explains that the purpose of Trinity Financial Advisory Board is to provide guidance to the firm’s unique niche clientele. Through their own life experiences, men and women of strong values and faith help guide athletes and entertainers through many of the challenges that celebrity can often bring. “I am both honored and excited to have this opportunity to serve on Trinity Financial’s Advisory Board. I hope to be able to make a meaningful contribution to the great work that Peter is providing,” says Barry Habib. Barry Habib is an American Entrepreneur. He is the Lead Producer, Managing Partner and majority shareholder in Rock of Ages – a musical theatrical production running on Broadway and Toronto, as well as Touring the US. He is the Founder & Creator of Mortgage Market Guide, which helps to interpret and forecast activity in the mortgage rate and bond markets. After inventing the concept within the mortgage industry in 2001, Barry built, grew and then sold the company in 2007. Barry remained on as CEO until October of 2010. Barry previously founded Certified Mortgage Associates in 1989, a leading mortgage provider in Monmouth County, NJ. Barry had been consistently recognized as one of the Top 10 Loan Mortgage professionals in the US. After growing the company to one of the best known and respected in NJ, Barry sold the company in 1999. Barry is also a professional speaker on the financial markets, housing, negotiation, technical trading analysis, sales training, building relationships and motivation. During the past sixteen years, Barry’s teachings have helped hundreds of thousands in attendance. Barry has also enjoyed a long tenure as a market expert on FOX and CNBC Networks, including his Monthly Mortgage Report show, which ran for 13 years on Squawk Box. Along the way, Barry has successfully managed a Hedge Fund, authored a stock advisory newsletter, owned an insurance agency, and acted as managing partner in a real estate investment company. Barry currently a Principal Managing Director in HIS – Health Care Imaging Solutions, a company which he helped create. HIS is doing important work in helping to detect early signs of cancer and heart disease. 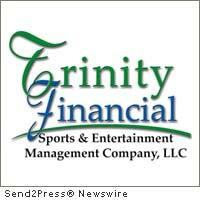 Trinity Financial, Sports & Entertainment Management Company offers a variety of services for individuals and small to mid-sized businesses. Additionally, through the assistance of co-founder and company consultant Lee Rouson, former New York Giants running back and two-time Super Bowl Champion, Trinity Financial offers specialized services for professional athletes and entertainers. Peter Grandich is a member of the National Association of Christian Financial Consultants. His daily financial blog, The Grandich Letter, is read online by thousands of investors at www.grandich.com . The company is located at 2431 Atlantic Avenue, Manasquan, NJ. For information about Trinity Financial, go to www.TrinityFSEM.com .